Does Jim Gray Drive A Car With A Jim Gray License Plate? Jim Gray Won't Say. Not so much a tip as what I thought was a hilarious license plate, especially if it is Jim Gray's car. Parked outside my office building this morning. In response to a question, Dan said he "had no idea why" Jim Gray might be near his place of work, though there are "a few offices/bank in our building." 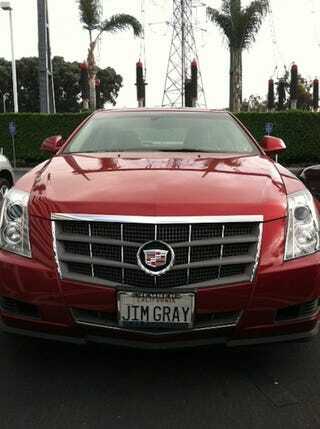 It's hard not to laugh at the thought of Jim Gray tooling around SoCal in a Cadillac with a Jim Gray license plate, Jim Gray's mind preoccupied by additional questions Jim Gray wished Jim Gray would have asked LeBron during The Decision. But does the car belong to Jim Gray? We wanted to ask Jim Gray directly to find out what Jim Gray would say. Jim Gray doesn't work for any one network, but Jim Gray is listed as a special correspondent for the Sacramento Kings. A member of the Kings' media relations staff offered to pass along our question to Jim Gray. We've since checked back on two occasions to see if Jim Gray had any response. We figured if the car wasn't Jim Gray's, Jim Gray would at least respond to say as much, lest anyone falsely assume a car with a Jim Gray license plate really does belong to Jim Gray. But Jim Gray never replied.